Motmots (Momotidae) are a striking group. An Oligocene (30-40 million years ago) fossil (Protornis) from Switzerland suggests that ancestors of contemporary motmots were from the Old World; climatic events and competition probably led to their absence. A fossil was found in Florida from the late Miocene (25-30 million years ago), before North and South America were joined by the Panamanian land bridge. More recent Pleistocene (20,000 years ago) fossils were found in South America, in several fossil quarries in Minas Gerais, Brazil. Climatic changes probably restricted motmots to Central America, and they later dispersed into South America (where little radiation occurred) about 2.5 million years ago during the late Pliocene. These events suggest that motmots are the only avian family with a center of origin and diversity in middle America. Motmots are closely related to bee eaters (Meropidae), Kingfishers (Alcedinidae), and todies (Todidae), with closest kinship to todies. In fact, the tody motmot (Hylomanes momo-tula) is considered the most primitive family member, and perhaps links the motmot and tody families. 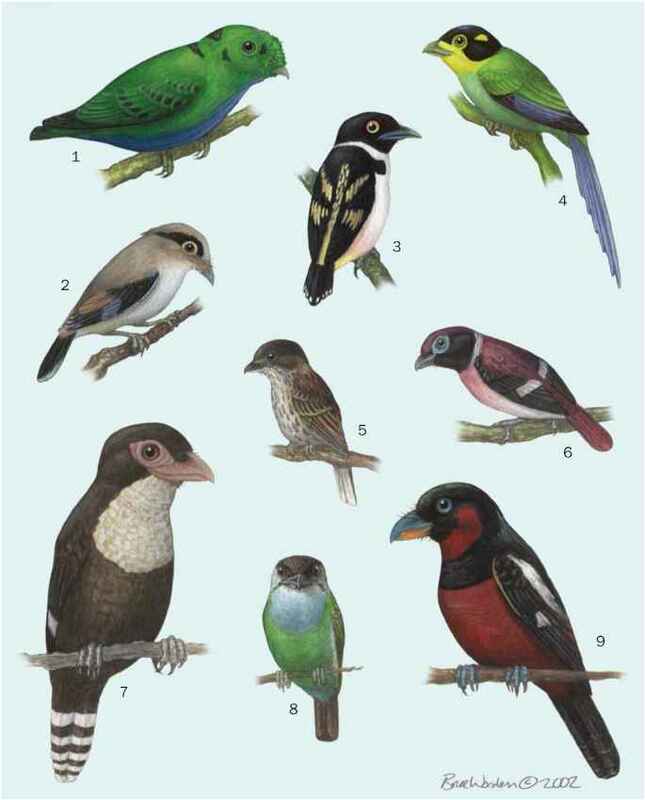 Shared characteristics of motmots, bee eaters, kingfishers, and todies include a unique middle-ear ossicle, aspects of limb musculature, DNA, bright plumage, little or no dimorphism between sexes, predation by sallying (short flights from a perch to seize prey and return to the perch), and earth-excavated nest burrows. All four families are Coraciiformes, which likely radiated in the Eocene, and include rollers, hoopoes, and hornbills. There are six genera with nine species. The turquoise-browed motmot (Eumomota superciliosa) represented by a single species, is more closely related to members of the genera Electron and Baryphthengus, each represented by two species, and the genus Momotus, represented by three species. These include the broad-billed motmot (Electron platyrhynchum), keel-billed motmot (E. carinatum), rufous motmot (Baryph-thengus martii), rufous-capped motmot (B. ruficapillus), russet-crowned motmot (Momotus mexicanus), blue-crowned motmot (M. motmota), and highland motmot (M. aequatorialis). The rufous-capped motmot, though superficially similar to other species, lacks a racquet-tipped tail, as do some populations of broad-billed and rufous motmots. This suggests relatively recent divergence in these closely related genera. Supporting this hypothesis, while conducting playback experiments between motmots occurring together in Amazonian Peru, field ornithologist D. F. Lane discovered that rufous, blue-crowned, and broad-billed motmots seemed to respond territorially to each other's voices. Several motmot species are found in secondary forests, often visually inconspicuous and widely distributed. Most motmots inhabit the midstory or understory of forest or woodland.